Seattle Pacific University invites the public to visit the Camp Casey Conference Center on Whidbey Island, a historic military fort built at the turn of the 20th century, during their open house on Tuesday, June 19, 12-4 p.m.
Free admission to the Sea Lab, a marine biology teaching facility. Free admission to the swimming pool during the open house. Tour of the Fort Casey Inn, a row of cottages formerly used as officer’s housing just before World War I. Guided tour of the Colonel’s House, which is used predominately as a retreat space for SPU leadership and special groups. The tour begins with a historical lecture by SPU Professor Emeritus of History Bill Woodward at 12 p.m. and 2 p.m., with tours led by Casey History Expert Steve Kobylk at 1 p.m. and 3 p.m. Guided walking tour of Fort Casey State Park and gun batteries will begin at 3:15 p.m. with History Professor Woodward. 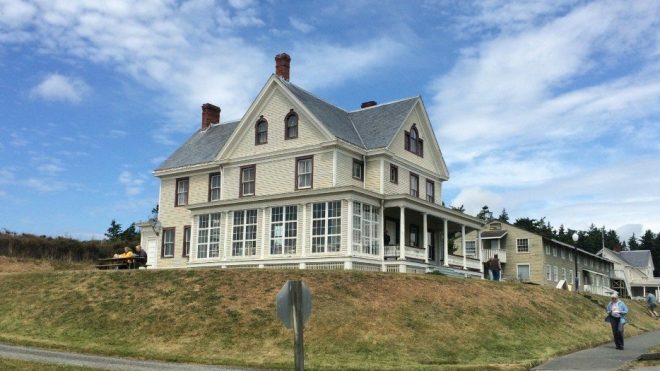 The Admiralty Head Lighthouse located in the park will be open from 11 a.m.-5 p.m. for tours. Camp Casey, originally known as Fort Casey, opened in 1890 by the U.S. military. Fort Casey, along with Fort Worden in Port Townsend and Fort Flagler on Marrowstone Island, became part of the “triangle of fire” to protect the entrance to Puget Sound. Within 20 years, Fort Casey was the fourth largest military post in Washington State, housing ten officers and 428 enlisted men. Fort Casey was decommissioned after World War II, and SPU purchased the property in 1956. The buildings have been updated and renovated to house school groups, churches, nonprofit organizations, and outdoor education classes. Let us help you plan your island getaway today! Fill out an Inquiry Form to make your reservation or call us toll-free at 866-661-6604. Camp Casey is owned and operated by Seattle Pacific University. © 2019 Camp Casey. All Rights Reserved.